A site-specific work that celebrates the 25th anniversary of the Americans with Disabilities Act (ADA), ON DISPLAY is a movement installation for diverse members of the community. This Brooklyn-based band blends curious electronic and folk instruments with original songs in Spanish in an interactive musical experience for the entire family. Foot-stomping, accordion-infused Indie-Americana stars celebrate sounds from the Mongolian steppes in a folk music concert featuring throat singer and morin khuur player, Nature Ganganbaigal. Rootsy singer-guitarist Aurelio Martinez of Honduras is ambassador of the Garifuna people's effortlessly lilting and bittersweet ballad style known as paranda. This groundbreaking musical redefined entertainment and changed the face of American theater. Spanning the years from 1880 to 1927, Jerome Kern and Oscar Hammerstein II's lyrical masterpiece concerns the lives, loves and heartbreaks of three generations of show folk on the Mississippi River, in Chicago and on Broadway. The musical's impact remains unparalleled, addressing racial prejudice. It introduced a bi-racial cast to Broadway at its premiere, while pointing the way toward a new synthesis between music and spectacle. This New York Philharmonic production features an all-star cast led by Vanessa Williams and Julian Ovenden of "Downton Abbey," as well as Norm Lewis, Jane Alexander, Fred Willard and Lauren Worsham. The Philharmonic's full sound highlights the lush musical score at the center of this epic show. This program is conducted and directed for the stage by Ted Sperling, and directed for television by Andrew C. Wilk. Check your TV listings for your local PBS station. New York City Youth Poet Laureates and Ambassadors will celebrate the power of voting and civic engagement. The performance features NYC Youth Poet Laureate Crystal Valentine, and NYC inaugural poet Ramya Ramana, along with other ambassadors of the program. Lincoln Center's new cinema series that presents performances by America's leading dance companies in movie theaters across the country will present Alvin Ailey American Dance Theater on this October date. The company will be shown performing its signature work, Revelations, created by its founder Alvin Ailey in 1960, which is an enduring tribute to the African-American cultural experience. Also on the program will be Chroma by Wayne McGregor, Grace by Ronald K. Brown, and company Artistic Director Robert Battle's Takademe. The film will be shown in more than 600 select cinemas nationwide, including 25 in the tri-state area. 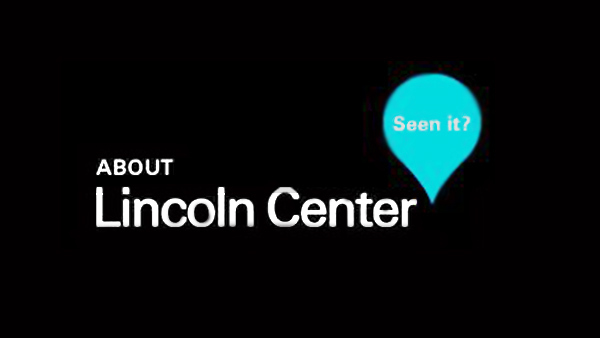 TICKETS for Lincoln Center at the Movies are available at FathomEvents.com and at participating theater box offices. For a complete list of theater locations visit the Fathom Events website (theaters and participating box offices are subject to change). White Light Lounges, Baryshnikov Arts Center, following each performance. White Light Lounges, Gerald W. Lynch Theater, following both performances. Endowment support for the White Light Festival presentation of Partita 2 is provided by Blavatnik Family Foundation Fund for Dance. Now in its 12th year, Celebrate Mexico Now brings New Yorkers an exclusive glimpse into how today's Mexican artists reflect on and reshape Mexican identity in an evolving global context. The festival's multi-disciplinary nature yields a comprehensive cultural picture of the passions and preoccupations that make today's Mexico so complex and fascinating. Composer and performer Danny Elfman descends on Lincoln Center with a symphony orchestra and choir, led by conductor John Mauceri, as well as a colorful assortment of Tim Burton fans. This unique episode, taped during the 2015 Lincoln Center Festival, arrives just in time for Halloween and captures all the excitement of this cultural invasion, climaxing in wildly entertaining performances of Elfman's most beloved scores from films in collaboration with Tim Burton, such as Batman, Beetlejuice, Edward Scissorhands and The Nightmare Before Christmas, which features Elfman singing his iconic songs. Accompanying the music are film clips from selected movies, as well as original sketches and storyboards created by Tim Burton. This episode is directed for television by Andrew C. Wilk. Costumed kids will fill Lincoln Center's plazas and halls at this festive Halloween celebration featuring trick-or-treating, a parade to live music, and activities for all ages. White Light Lounge, Alice Tully Hall Outer Lobby, following the performances.